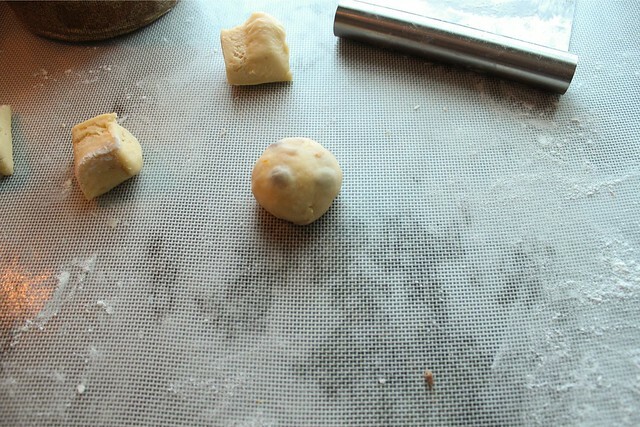 After a two month break from the Daring Baker Challenge, I finally felt up to participating. 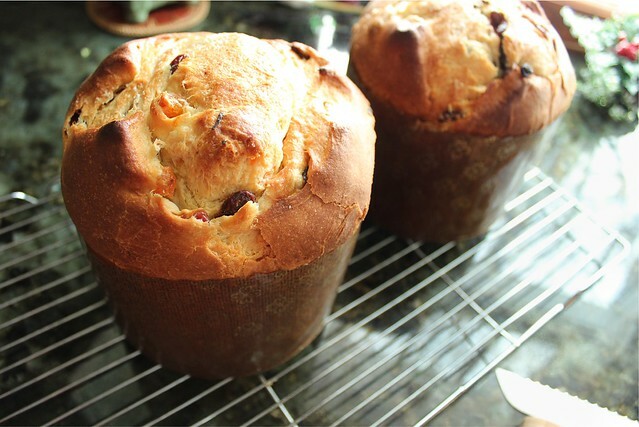 It helped that the challenge host, a blogger I've followed for years who is quite an accomplished baker, chose a bread that I've always wanted to make: panettone. I can tell I'm not quite back to my normal levels of crazy experimenter, because had I been, I'd have chased all over town checking Asian markets for elusive citron and candying them myself. 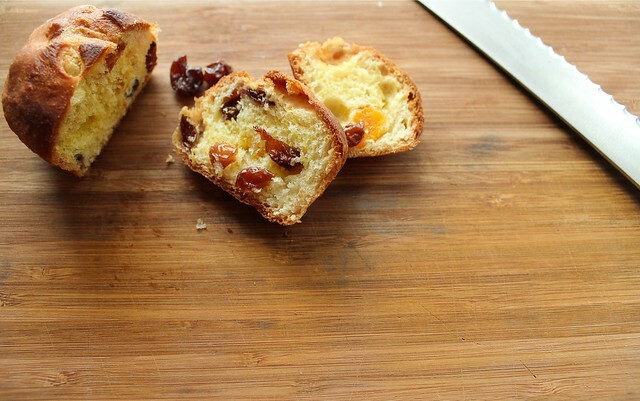 Traditional panettone contains ample amounts of candied citrus peels and the candy peel of the citron fruit, which is pith-heavy and floral citrus variety with roots in the Middle East and Asia. Had I more gusto and time, I would do a bit more digging and find out how this unusual fruit happened to become the most important ingredient in an Italian delicacy - but I'll save that curiosity for another time. This heavily fortified bread reminded me of pan de muerto. With so much butter, you could hardly expect it to be tender and light, but it is. Despite the fortification, it also "stales gracefully", with a changing texture and deepening flavor complexity as the days wear on. I made the breads at my parents' farm, where I have spent the entire week catching up on relaxing and enjoying heavy dustings of picturesque snowfall, which always seem to miss us so close to Lake Michigan lately. My Mom graciously bought me some candied citron and fruitcake mix to use in my panettone, but after smelling and tasting the rising dough we both agreed that we couldn't ruin it with grocery store standard (and quite chemically tasting) fake peel. Instead, I used the remainder of a little packet of wonderfully delicious candied Meyer lemon and sour orange peels that Julia sent me in a Christmas card (and I didn't send out a single card this year, either...). I chopped it very small, and added it to a mixture of real dried fruits my Mom had on hand: some dates, cranberries, dark raisins, and apricots - all soaked in boiling water to soften them. Combined with the small amount of candied peel and the zest from both a lemon and an orange, my panettone may no longer be truly Italian in nature, but it was more than delicious. I couldn't be more thankful I didn't use the fake, supermarket peel in them! Last year, I had intended to babysit my starter for a week and feed it multiple times per day (while maintaining it at a specific temperature as specified over at Wild Yeast to make sourdough panettone. My neighbor had two paper molds that she gave me, and I've stored them for a year. 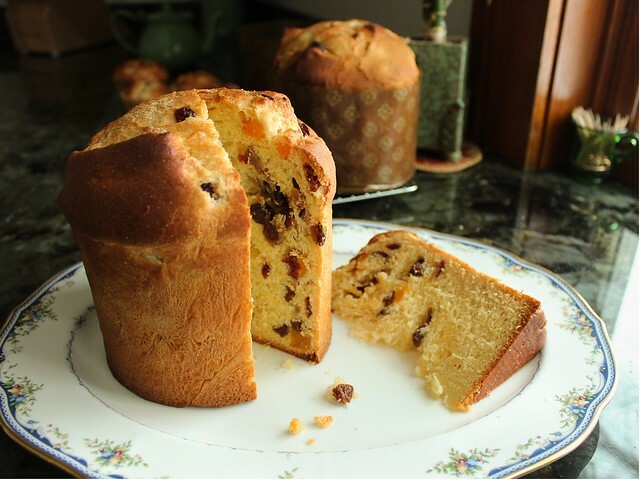 This was definitely the year that I had to make the panettone. 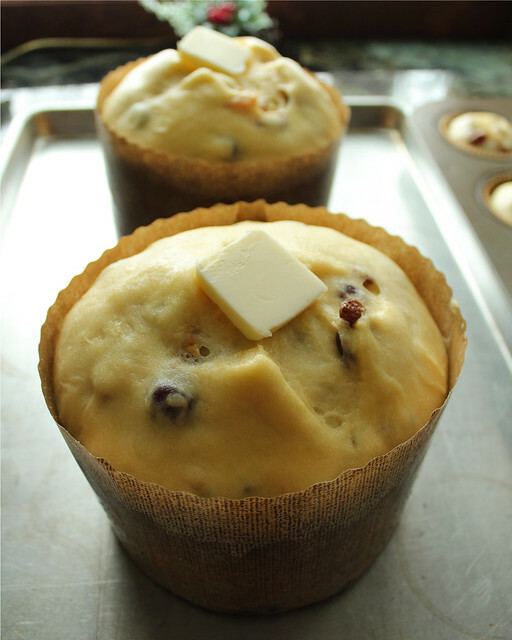 I made some slightly smaller in muffin liners to compensate for the 1/2 inch I was lacking in diameter. 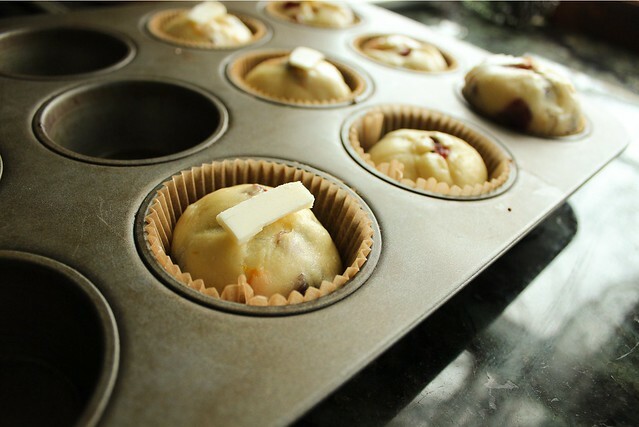 In general I think portion control is a good thing, and I would definitely make the muffin-sized breads again. As a note, I'll remember that filling the tins nearly to the top with a ball of panettone dough made a prettier and slightly heftier miniature bread. I hope I continue to feel well enough to continue with the DB Challenge again next month. I forgot how excited I get when I try something and it meets all of my expectations (not that it happens every time with the Daring Challenge...). 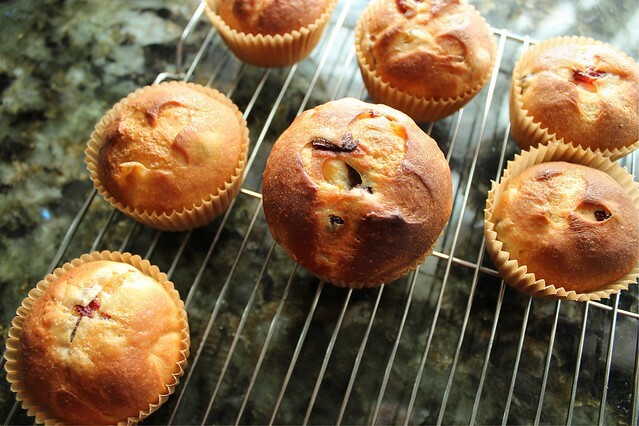 A huge thank you to Marcellina for choosing such a wonderful recipe! I'm certain that I'll be making this again next year!